To the Editor: This study aimed to establish patients' understanding about the management and use of drugs that were prescribed for them, and in particular their effects and side-effects, and the level of practitioner counselling on drug management and use. Most of the patients studied had been informed about the nature of their illness. Most took their drugs correctly, but a substantial number had little knowledge of the effects and side-effects of their medication. The study results suggest that those caring for the patients did not consider it necessary to inform them about their management, and underline the need for additional counselling of patients about prescribed or dispensed drugs. Drug consumption in developing countries is steadily increasing, as a result of increased prescribing, dispensing and self-medication.1-3 After examining pharmaceutical use in rural populations, it was found that between one-half and two-thirds of medicines taken were used irrationally,4 and one-third of the medicines taken were potentially dangerous. There was little awareness of possible hazards from modern medicines, and the general view was that they could be used for any sickness or discomfort.5 Such inappropriate use of drugs results in wastage of resources, increased resistance of pathogens, serious health hazards, adverse reactions and prolonged suffering. Knowledge about their medication was examined in 100 randomly selected adult patients, in a prospective cross-sectional study using a structured open-ended questionnaire. The study was conducted at 5 facilities in the Waterberg District of Limpopo Province: Mokopane Provincial Hospital, where patients were seen by specialists; Voortrekker District Hospital, where patients were treated by general practitioners; Mogalakwena TLC Clinic; Mookgophong Health Centre (which has a doctor); and Mookgophong Clinic, where care was provided by primary health care registered nurses. A data collection sheet and a descriptive logistic regression analysis were utilised. The median age of the patients was 39. Fifty-three per cent were male, 75% black, 19% white, and 6% Asian. Eleven per cent had no formal education. Twenty-seven per cent had primary, and 49% high school, education. Twenty-one per cent had tertiary education. Forty-two per cent were unemployed. Twenty-nine per cent lived in informal housing. Sixty-two per cent lived in urban or semi-urban areas. 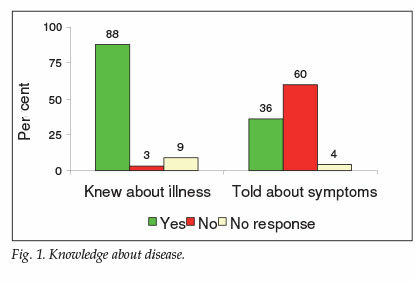 Most respondents were aware of the diagnosis of their illness. Forty per cent had been informed about their symptoms (Fig. 1). However, while 71% were taking their medication correctly, nearly 80% had not been told of the effects or side-effects of treatment (Fig. 2). Gender, age or marital status did not influence knowledge of drug usage. However, the level of education, class (informal settlement/urban) and race contributed to the level of knowledge. Patients with tertiary education, those coming from urban areas, and whites had significantly more knowledge than the remainder of the cohort (p<0.05). The majority of the patients in this study were informed about their illnesses by their doctor or nurse. More than 70% took their medication correctly, which included those with the lowest levels of education and the poorest socio-economic backgrounds. 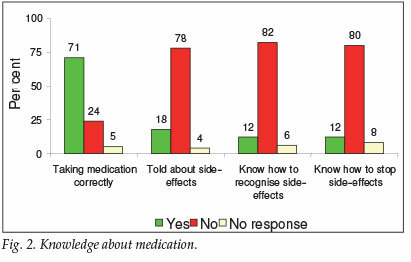 However, when asked about the side-effects of the drugs they were taking, most of the respondents were uninformed. In contrast to their more-than-adequate level of communication about their patients' illnesses, most practitioners seemed to avoid counselling patients on the effects and side-effects of therapy. It is hoped that this study will increase awareness of the need for effective counselling on drug effects and side-effects. I thank Professor J Snyman (Head of the Department of Pharmacology, University of Pretoria (UP), Dr Steve Olorunju (MRC), Dr A Berg (UP), and nurses, pharmacists and physicians of the Voortrekker and Mokopane hospitals and Mogalakwena and Mookgophong Clinics; and the Limpopo Department of Health and Social Development.